I used to love to pick up books and just read. Going to a bookstore was like dying and going to heaven for me. After I started going blind and found it evermore difficult to read a printed book I took to buying or borrowing CD Books which I listen to even now in the car or on my Sony CD Walkman. I also enrolled at the local Library for the Blind in Fresno CA. They provided me with a free cartridge player. I provided them with a list of my favorite types of books and they exchange my old books on cartridge by mail as I finish them and send them back. I also have my Intel Reader (For my review click here). TheKindle Touch is retailing at just under $100. You may think that using the touch screen would be difficult for a blind person, but if you can get a sighted friend to give you help aligning your fingers to where the on screen selection areas are using the touch soon becomes natural. It can be difficult to find older downloaded books though as you need to key in page numbers for your book list. A hit and miss affair with the small number buttons and big fingers like mine. Books can be ordered to download from any computer or the kindle itself and many of the titles available today come text-to-speech enabled for the same price or even less than a standard printed book. 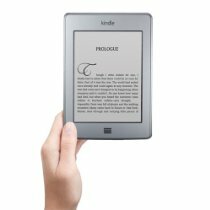 Kindle also has access to its own lending library of free books which can be ordered just like any other book except you need to return an old borrowed book before the download completes. The free lending library service comes with Amazon Prime membership which also entitles you to free expedited shipping on purchases which need to be delivered to your door by UPS or USPS. The Kindle Touch has a good battery life, I often have the voice reading my books to me for eight hours per day and it can take up to three days to get a battery low warning. The Kindle Touch has two voice settings, male and female. Personally I prefer the male voice, it is less synthetic sounding than the female voice. Though at times my Kindle can sound a little Like HAL the computer in the movie 2001 A Space Oddessey. If you are looking for an inexpensive way to keep reading, I would recommend the Kindle Touch as a good place to start.